Gluten and dairy free, these Coconut Puffed Rice Treats are super tasty and healthy but contain no marshmallow or refined white sugar! 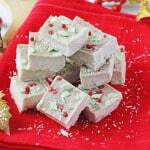 Rice Krispie treats have long been a firm favourite childhood snack. I think the key to their generations of success is probably in their simplicity; crispy rice cereal and chocolate… it doesn’t get much easier than that! 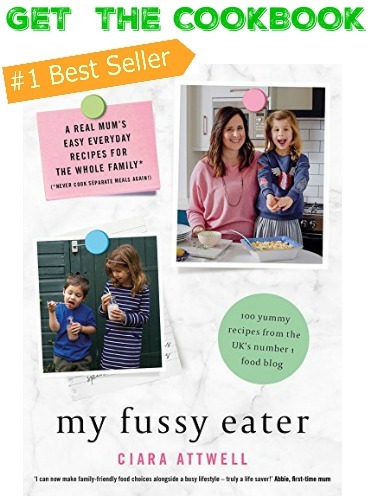 My fussy eater is a big fan and you know me, I always like to put a slightly healthier twist on things so here’s my own version! First up I’ve swapped the Rice Krispies for this puffed brown rice. As cereals go Rice Krispies aren’t the worst in the world but they do contain some unnecessary sugar and salt (Rice Krispies are 10% sugar whereas the above brand of puffed rice is 0.7% sugar). 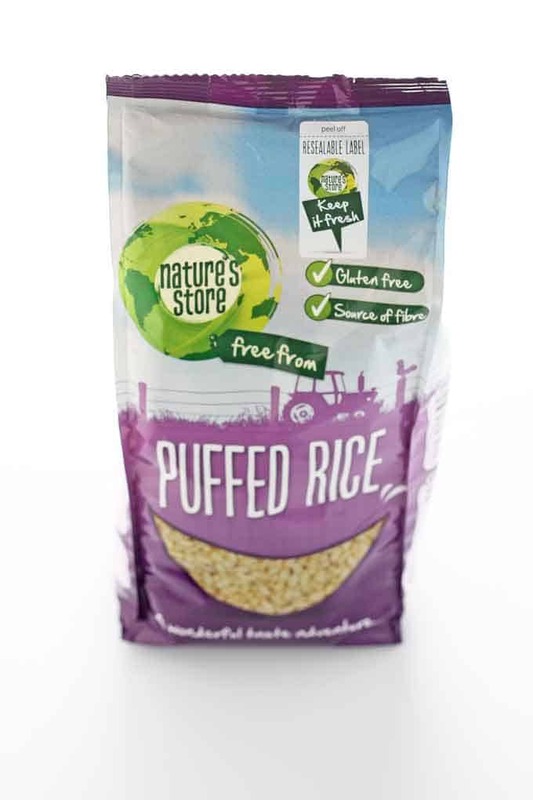 Puffed brown rice also contains three times the amount of fibre so nutritionally you are getting a lot more. 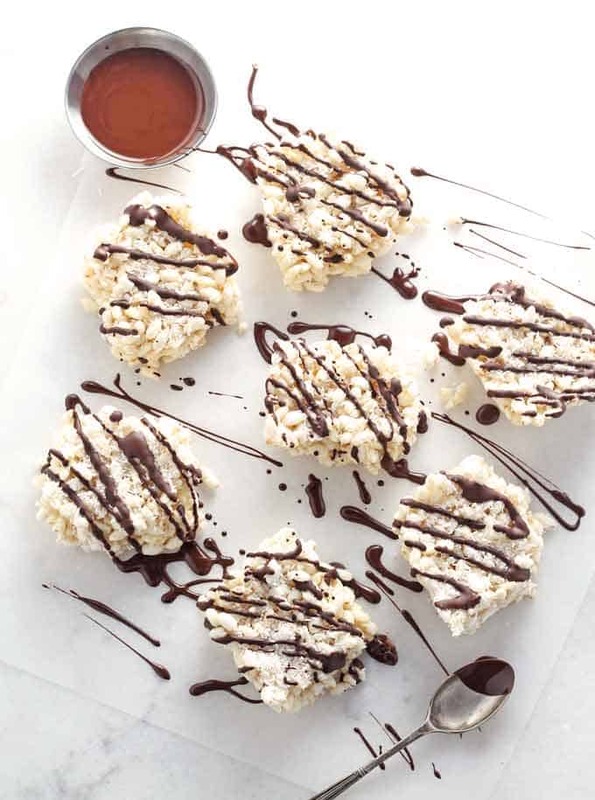 One thing worth mentioning however is that puffed rice is usually not as crispy as Rice Krispies so your treats will have a slightly softer texture. So if crunch is important to you, it might be worth searching around for a more cripsy brand of puffed rice! Instead of chocolate and marshmallows, these treats are bound together with a combination of coconut oil, coconut cream and honey that honestly tastes like white chocolate. It’s amazing! 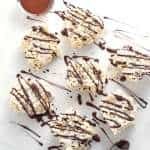 So not only are these rice snacks gluten free, but they are also refined sugar and dairy free too (just be sure to use dairy free chocolate for the drizzle). Oh, the drizzle…. ok it isn’t entirely necessary but doesn’t everything taste a bit better with a drizzle of dark chocolate on top?! So what do you think? 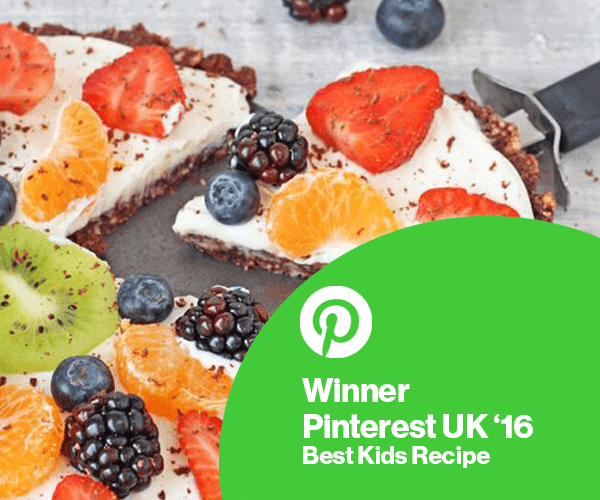 Is this a recipe your kids might like to get involved in making? Melt the coconut oil in a saucepan over a medium heat. Add the honey, coconut cream and vanilla extract and mix well. Add the puffed rice or rice krispies and the desiccated coconut and stir until everything is well combined. Line a baking dish with greaseproof paper. I used an 8 x 8 inch pan but you can use any size depending on how thick or thin you want the treats to be. Transfer the mixture into the pan and press down firmly with the back of the spoon in order to make the mixture as compact as possible. Sprinkle the remaining desiccated coconut on top. Cover the dish with tin foil and put it in the freezer for approximately an hour or until the mixture has firmed up. Once ready, melt the chocolate and drizzle it on top and cut into 9 square shaped treats. 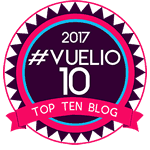 The treats will keep in an airtight container in the fridge for up to 3 days. Fabulous recipe. Always on the lookout for healthy treats for my small person and these are just the thing! Thanks!! Hi, I’m looking for things to freeze for my daughter lunches. Will these freeze and defrost ok? No I don’t think they should be frozen. This turned out really crumbly. I just finished making it. Taste is delicious, but the rice didn’t set through ???? I just finished making these, and oh my goodness they are amazing! So glad I found your recipe, I did add come glazed cherries (they needed to be used up) and they turned out great! They taste a little christmas say now 🙂 thank you! Oh wow the glazed cherries sound like an amazing addition. So glad you liked the recipe! Thanks for sharing! Did you try lightly toasting the puffed rice in a pan? I think it MIGHT make them crispy (as long as you don’t mind a toasted colour I suppose). No I don’t Vee, never thought of that. Genius!!! I’ve been looking for a recipe like this- no marshmallows and using coconut oil! Thanks! One question- can I substitute The coconut cream with something else? Hi Kay, I haven’t tested the recipe with anything else so I couldn’t say for sure it it would still work the same. What did you want to replace it with? I used peanut butter instead of the coconut cream and they turned out delicious! Ouuu yummy! I’ve been tinkering with a new recipe kinda like this one but using peanut butter. It tastes amazing doesn’t it! Could you swap honey for stevia? Sorry Shelley but I’m not familiar with stevia so I couldn’t say for sure. The honey works to sweeten the treats but also acts as a binder so the stevia would need to be similar to work. Looks fabulous, putting it together and cant wait to taste test. I do have a question about the amount of desiccated coconut, is it really supposed to be just ½ tsp that goes into the mix? thank you in advance. Oh Vicki I’m sorry! Don’t want to make you cry!!! Please can you post me 2 or 3 of these? Ha ha, you are a week too late I’m afraid!! These look delicious, I loved puffed rice. 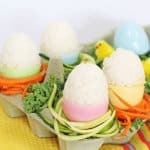 My kids would LOVE to make this! Ive never seen the puffed rice before but it sounds really good, and the coconut/honey combo that tastes like white chocolate sounds divine. We will try this during Easter hols! I’m so glad I found this on #tasty Tuesday. 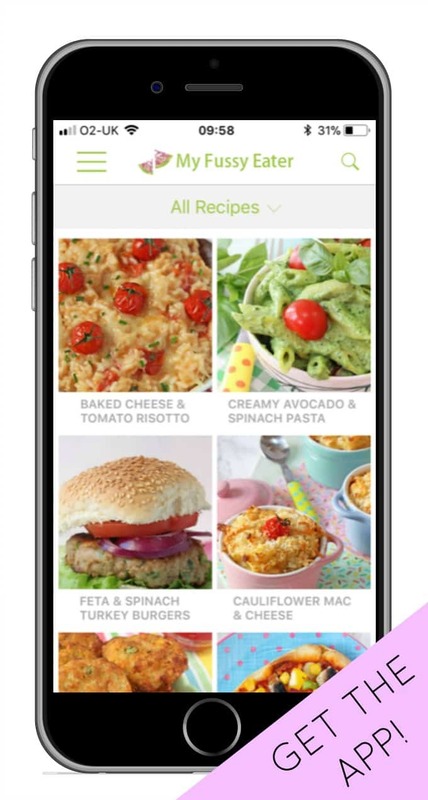 I loved the pretty picture so v excited to also find such a delicious looking healthy recipe. Will definitely be trying these out! Thank you Rachel. I hope you like them as much as we did! You have no idea how much I love rice crispie treats. I once made a whole 12-inch birthday cake out of them for husband and then ate half of it. I wasn’t well after it, but it was sooooo worth it. Shall be putting this on my to-make list. A whole cake? Oh my, that’s incredible!! Thats a shame Diana. You can easily replace it with butter though. YES to cacao butter. That would be immense!!! 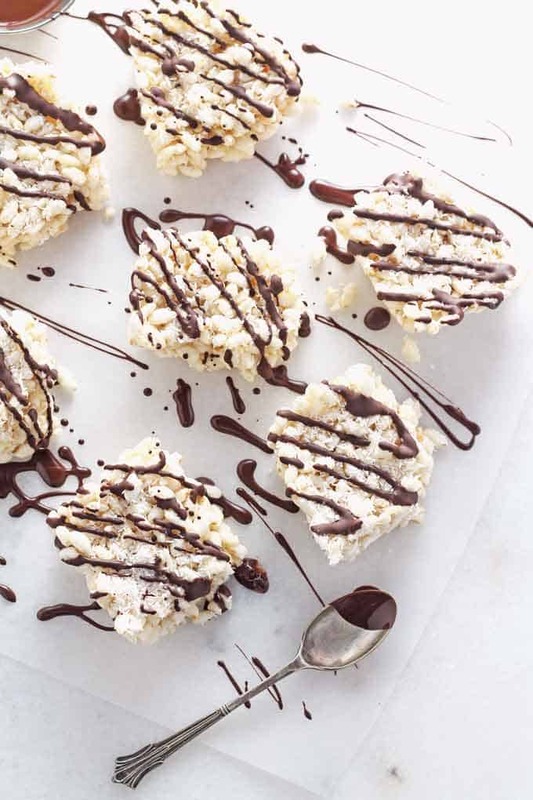 these look & sound lovely – I’m a big fan of coconut but the kids aren’t keen..I keep hearing about puffed rice in weight watchers groups but I haven’t yet tried it. I didn’t realise rice crispies contained so much sugar! I know, it’s crazy isn’t it Helen. You think the humble rice krispie looks so innocent!! 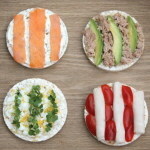 These look delectable and perfect for that teatime snack. Thank Nayna. Perfect for teatime indeed! 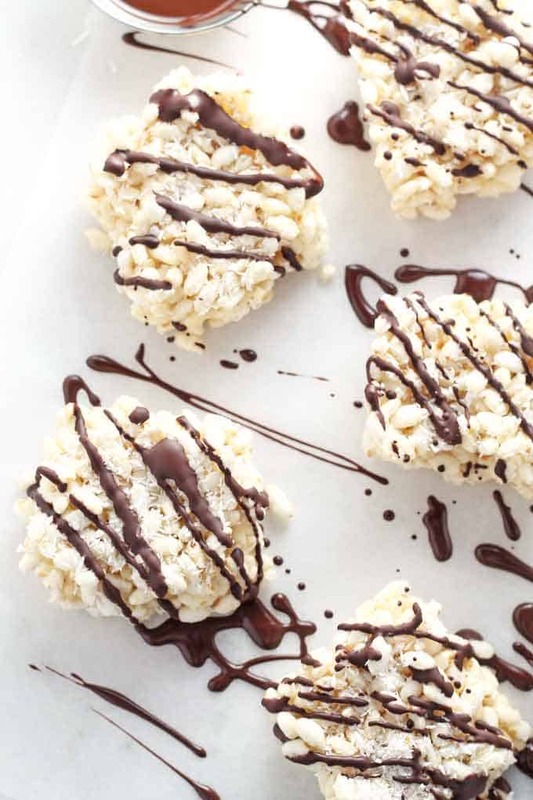 What a good idea to use puffed brown rice rather than rice krispies! These look fab, and so much healthier too. Thanks Harriet. They are so so good!